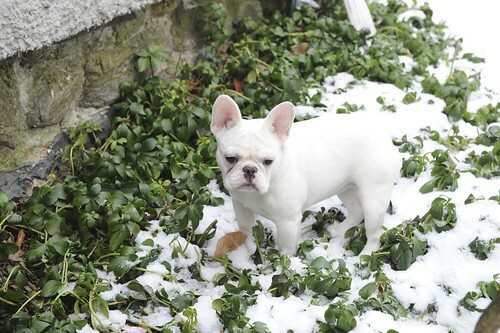 It’s hard to believe that our last round of French Bulldog puppies are almost seven months old. With age comes the thought of show ring careers, so I thought we’d update you on what’s going on with our budding beauty queens (and king). Over in Illinois, Andrea Morden Moore and the lovely Luke are getting ready for their show ring debut. Luke has already been doing some ring training, and Andrea says he is progressing quite nicely. I’m very pleased with him, albeit only from his photos. Luke will be making his ring debut at the Chicago International Kennel Club show, which takes place the last weekend in February. Originally, most shows were “benched” in some fashion, where the entered dogs were required to be in assigned areas (on benches) at all times when not being judged in the ring. This allowed for interaction of dogs and their owners with spectators and other owners and breeders as an educational process. What this means, in essence, is that all the dogs of a single breed are set up in the same area in between showing. All of the French Bulldogs, for example, will be together, which means you’ll also have easy access to all of the French Bulldog breeders and exhibitors who are at the same show. Many times, people will set up little informational booths and displays, often with the breed clubs or local breed rescues also offering a display. There are very, very few benched shows left in the world, and while exhibitors might complain about them, there are really no better shows for the average public to attend. 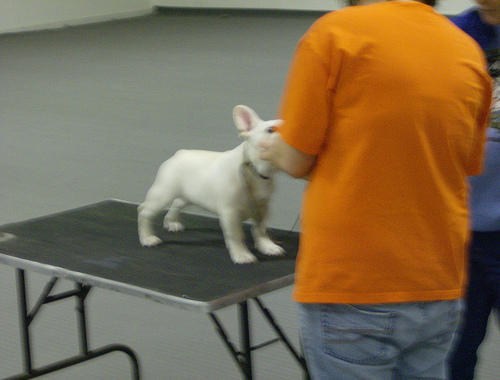 Benched shows are ultimately intended to provide a way for the public to interact with large groups of breeders and exhibitors, all in one place, and most people who enter benched shows do so with the understanding that they will make themselves available to answer questions about their dogs and their breed. If you live in or near the Chicago area, Luke and Andrea would LOVE to have you come out to meet them, and to cheer for them. As I mentioned, they’re only entered in the ‘benched’ portion of the show, which is Saturday and Sunday. I’ll be posting entry times as the show dates gets closer, but please let me know if you plan to attend, so that they can keep an eye out for you. Up in Michigan, Sue Simon had been hoping to attend the IKC show with Luke and Leah’s dad, Dexter. Unfortunately, the timing isn’t great right now, so she’ll be entering him in some local Michigan shows, including Cobo Hall – which just happens to be another benched show! This means another great chance to come out and meet with dogs and their owners, including the Dashingly Devious Dexter. Please give him a head skritch from me, and tell him to try to behave himself for Sue! Over on the East Coast, Luke’s sister Leah is also getting ready for her show ring debut. We’re currently working out details for the Lovely Ms Leah to head up to Canada, where she’ll be ably handled by the ultra talented Kay Reil, who finished Butters for us last year. I have high hopes that Leah will make it up in time for the CKC’s Charitable dog show event, the Purina National dog show. This year’s show should have a great turn out, as it’s being held at the Interational Center near the Toronto Airport. Last year, Butters made her debut at the Purina National, and it would be nice to see Leah do the same. We’ll be offering a breed information booth at the Purina National this year, and again – we’d love to see you come out to meet us, and to learn more about Frenchies. Also on the east coast is Finlee, Delilah’s Dexter daughter. Finlee and her new mom, Amanda, will be making their ring debut some time later this spring, and we look forward to hearing more about their progress. We also need Amanda to send us more photos – Flickr is your friend, people! Last but hardly least is our own little Dex-ette, Pickle. She’s coming along quite nicely – her body is lovely at this stage, but her head needs to catch up with it. Right now, she looks like she’s got a mature body, with a puppy head. We’re going to give her some time for all of her bits to catch up with each other before we put her in the ring. Some pups just aren’t fully finished until a year or so, and I’m in no rush to get her out there. We’re aiming for early summer, with our fingers crossed. In the meantime, we’re going to do a local obedience class, as I think it will be good for her confidence. I hope Barb can’t read the blog from Heaven – she used to freak out when she heard I was putting show puppies into obedience class! It’s that lingering, old school belief that “if you teach them to sit, they won’t stand in the ring!”. I think they can learn to do both, and I think it’s good for them to be stimulated and learning something other than just to be pretty faces. How about you – if you have show prospect puppies, are you making plans for spring? If you’re a pet person, have you ever attended a dog show, or would you ever? Not to be left out…. (And since you’re doing some obedience I’ll forgive you), but there are some of us who are betwixt and between show and pet by exploring the wonderful world of performance with our frogdogs. At nine months my Wiggin has his Novice Trick Dog title and is working towards the next one, STAR puppy (AKC) certification, and is working on freestyle and obedience, with no debut in sight yet. We’ll start agility in the spring, when the snow is gone and he’s more mature. Your pups look lovely, BTW.